On the base of this ceramic cat is my name and the year 1984. I don't know why it has my name on it, because I'm pretty sure my mum painted this green-ware cat when I was 13 years old. 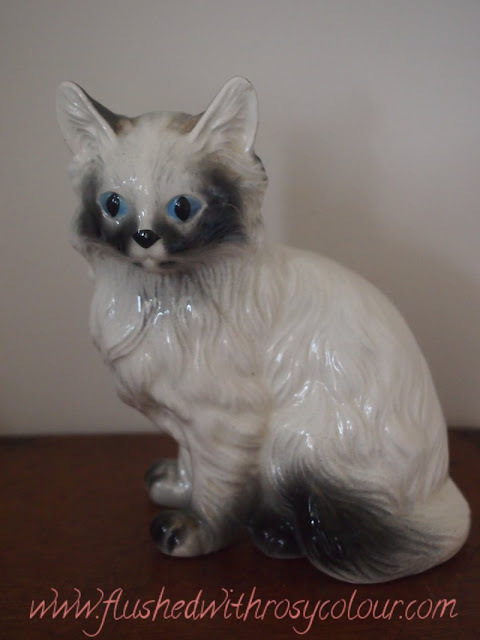 I've always loved cats, and teenage-me wanted a ceramic cat, but it had to be a Siamese cat you see, and I couldn't operate the spray paint machine! My mum kindly painted the cat for me, I don't think I even did the eyes, I just wasn't as good a painter as my mum. I think I might have just prepared the green-ware by scrapping and sanding the seams. I think this is a very special cat for our family treasures collection!